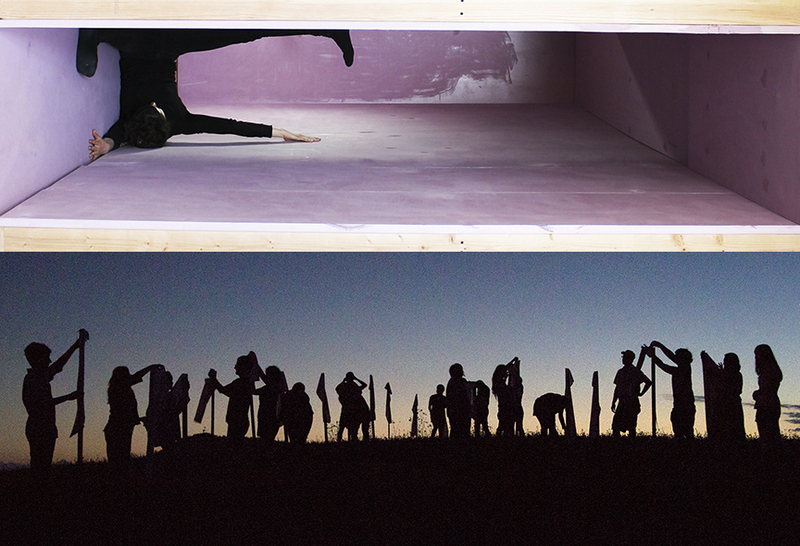 POTENTIALITIES brings together work by two performance-based artists. Milcah Bassel’s performances engage with the dichotomies of interior and exterior, body and architecture. Placing her body in confined and challenging architectural spaces, she plays on particular ideas of desire coming from the creation of boundary. For “Intimate Boundaries” Bassel utilizes the unique architectural element from Roxaboxen Gallery’s history as a funeral home, the coffin shaft, as another boundary to explore gestures of bodies in confined spaces. Teruko Nimura enacts participatory performances involving her surrounding communities, including the community of residents during her 2012 residency at ACRE. Drawing on traditions and rituals of Asian, Asian American and Native American cultures, she explores notions of collectivity- the moments before a group comes together and the remnants of a collective effort. Varying approaches to documentation of these performances will be on display along with an on-going live performance. MILCAH BASSEL (born 1981, Boston, MA) was raised in Jerusalem, Israel. Her work spans various traditional and new media. Recent projects have evolved into multi-faceted installations combining interior and exterior spaces, hand made objects and performance with and for lens-based media. These pieces explore the complex and constantly shifting relationship between bodies and framed spaces through processes of repetition, variation and reconfiguration. Bassel studied drawing and painting at the Jerusalem Studio School. She was a massage therapist and managed an alternative medicine clinic in Israel before returning to the USA in 2010 for a Post Bacc program in Studio Art at Brandeis University. Recent exhibitions include a solo show at Dear Noga gallery in Jaffa, Israel; Kniznick Gallery at the Women’s Studies Research Center at Brandeis University; the West Windsor Arts Council, NJ with The Fertile Crescent Project; a live performance at Trestle Gallery, Brooklyn; and an upcoming group show at Soho20 Gallery in NY. Bassel is currently an MFA candidate at Mason Gross School of the Arts at Rutgers University, and lives and works in New Jersey. More information about Milcah Bassel can be found at milcahbassel.com. TERUKO NIMURA was born and raised in Northern California. She received a BFA in sculpture from the San Francisco Art Institute and MFA in studio art from the University of Texas at Austin. Her work includes drawing, painting, sculpture, installation, shared activities and performance exploring issues of identity, community, and Eastern, Asian American and Native American spiritual and cultural traditions. Nimura has shown in California, Texas, Michigan, Illinois, and Mexico. She was included in New American Talent 23 curated by Nato Thompson at the Jones Center for Contemporary Art and had a solo show in 2011 at Testsite in Austin. She is currently preparing for an exhibition in Houston for the 2013 National Council for Education in Ceramic Arts Conference. Nimura lives and works in Austin, Texas. More information about Teruko Nimura can be found at www.terukonimura.net.